Hi friends! Sorry that I'm blogging so late in the evening! I am just not feeling well today. I did want to share this Stamping Bella cuteness with you though! 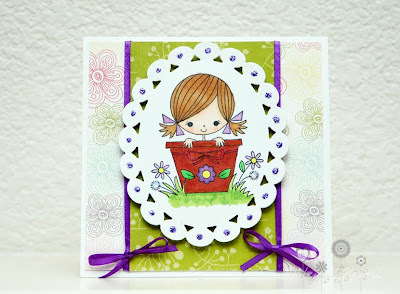 This is my first time playing along with the Stamping Bella Friday challenge and I had a blast!! They supplied a sketch this time. I'm not sure if the super thin ribbon makes this card look kind of "old school" but I thought having those sweet little bows like in her hair would be super cute. This image is Florence the Flower Pot girl. Isn't she super cute?! I have some more stamps from this line coming and I can't wait!! Eeeek! This is so cute. I love this image and great take on the sketch. Love the ribbon.